Hershey’s Chocolate World in Hershey, Pennsylvania is so fun! Read our guide for information about its attractions, ticket prices, hours, and parking. To say that we were excited to visit Hershey’s Chocolate World is an understatement. We practically skipped to the front doors, and not because it was starting to drizzle lol! 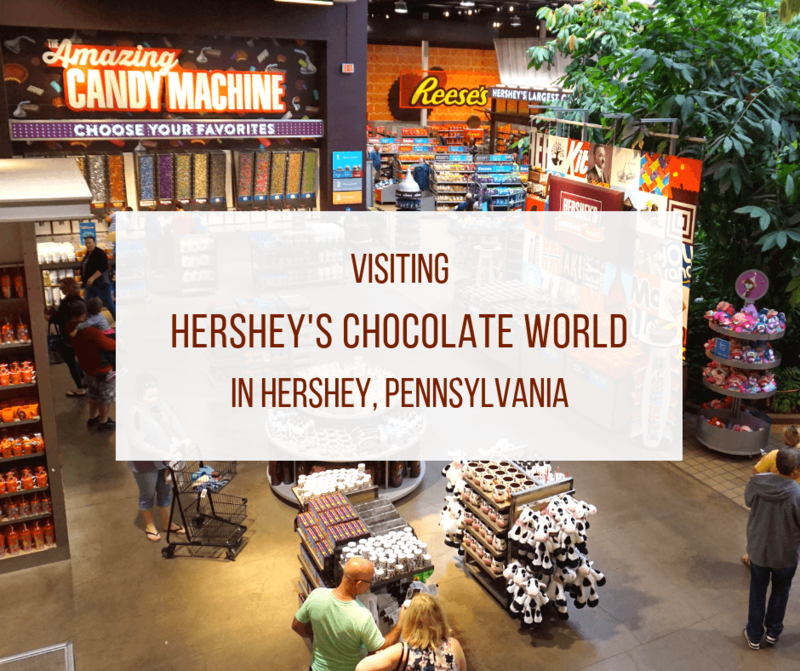 Besides going to Hersheypark, with it’s fun roller coasters and games, visiting Hershey’s Chocolate World is one of the top things to do in Hershey. There’s a fun photo op as soon as you walk in! There are quite a few activities at Hershey’s Chocolate World, and we were able to do almost all of them. We spent the day learning about Milton Hershey and how delicious Hershey chocolate is made. And of course, we ate plenty of chocolate! Admission into Hershey’s Chocolate World is free, as well as the Hershey’s Chocolate Tour. All other activities require a ticket. Depending on what activities you want to do, there are various ticket bundles you can choose from. This was the first activity we did, and we’re glad because it gave us a bit of background information about cocoa beans and about the process of making chocolate. It’s a cute ride and lasts about 30 minutes. It runs continuously so just get in line when you’re ready to ride. It is wheelchair accessible and, as we mentioned earlier, it’s free to ride. And they give you a complimentary piece of chocolate at the end! We were really impressed with the chocolate tasting experience! It’s like a wine tasting, but with chocolate! We were shown how to use all of our senses to distinguish between different kinds of chocolate. So taste isn’t the only way to tell the difference (although the most fun). The tasting experience lasts about 30 minutes and you’ll get plenty of chocolate to try. Hop aboard an old-fashioned trolley! On this tour, guests are taken around the town of Hershey and learn more about Milton Hershey and his inspiring work as a chocolatier and philanthropist. Our conductor was hilarious and knew so many interesting facts about Milton, the town, and the company. And not surprisingly, lots of chocolate is handed out during the tour that lasts just over an hour. The Hershey Trolley Works operates rain or shine! Our conductor made the history of Milton Hershey come alive! This was absolutely our favorite part of the day! After you don your apron and hairnet, you head in and use interactive monitors to pick the ingredients of your chocolate bar. You pick the kind of chocolate bar (milk, dark, or white), the filling (chocolate nibs, pretzels, etc), and if you want sprinkles. While the bar hardens, you also get to design the wrapper of the metal tin it comes in. You shuffle along to see each stage of the process and your name is shown on different machines so you can easily track your candy bar. This will take the longest of all the activities (about an hour). Everyone has their phones out and they’re trying to take photos and videos of their candy bar. We get it; we did it too. The only frustrating part was when some people took longer and then backed up the line and you missed your candy bar going through one of the machines. Buddy is ready to make a candy bar! Vicky rocking the hairnet and apron! Shop at Hershey’s Largest Candy Store! You’ll find all kinds of sweets, but you’ll also find awesome souvenirs and gifts. We recommend doing your shopping early, as the lines get incredibly long towards the end of the day. You do have the option to check your bag of purchases for free, so you don’t have to walk around with it all day. The Hershey Chocolate World Store has so many fun goodies! At Hershey’s Chocolate World, there is a food court and bakery. There are sandwiches, pizzas, soups, and of course many chocolaty food items. We had some coffee and a chocolate and peanut butter scone. It was delicious! Hope we didn’t drool on the glass… lol! Hershey’s Chocolate World is open most days of the year and most days it is open pretty late, but their hours vary by month and day. We recommend checking their calendar before your visit. So how much does it cost to park at Hershey Chocolate World? Parking is free for up to three hours. However, most likely your visit will be more than three hours. The cost of parking between three and five hours is $15 and anything after five hours costs $40. However, if you purchase tickets to the following four activities, you get free all-day parking: 4D Chocolate Mystery, Create Your Own Candy Bar, Chocolate Tasting Experience, and Hershey Trolley Works. Pro Tip: Also check out these Fun Things To Do In Harrisburg, Pennsylvania. Who doesn’t love the Chocolate! I mean especially me! Thank you so much for this interesting post! And I really like your little Monkey. I see that YOU and your ‘buddy’ had fun. Hershey is a great town. There is much to do there even when Hersheypark is closed. I only live a few hours away. I know that you had plenty of chocolate. There are a few other things there too like the Hershey Gardens and a great bus museum. How fun! This was something we wanted to do when we were on the East Coast but never made it! Hopefully next time.